Our 1 click survey is sent automatically through your CRM or on an email signature. Employees can be automatically rewarded for great service which is made public on our newsfeed. Employees are recognized and rewarded by their managers and peers for great work based on their company culture and goals. Recognition is sent to the newsfeed for everyone to see. You can align and communicate company goals with your team by creating goal based contests. Top performers will be rewarded for hitting company goals. With Crewhu, you can reduce employee turnover, increase customer retention + monthly recurring revenue + profits! CrewHu is an amazing platform for engaging your employees, and rewarding the great work done by your team. 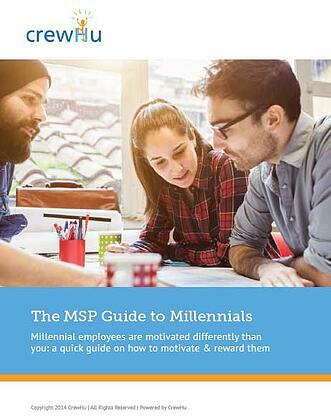 It is social, fun, and a great way to motivate top performance in your MSP. The features extend beyond recognition and empower customer surveys tied to service techs and tickets. We have never been able to quickly see what all customers think of one service rep until deploying CrewHu. Hands down, a game change for culture and your team environment! Our team's collaboration has increased greatly since we introduced CrewHu. If you walk through the helpdesk you will hear team members excited about giving colleagues badges (based off our core values) for assisting on a ticket. I even love giving out the core values and special management badges! We have also implemented Crewhu's simplified client surveys that recognize and reward team members that deliver great service. Our survey responses increased 5x. I highly recommend CrewHu. CrewHu is a huge part of our culture of employee recognition at 24hourtek. Our team loves the instant feedback rating. With CrewHu, employees know exactly where they stand in relation to company goals, and are instantly rewarded for meeting or exceeding those goals. Working with Stephen and the team at CrewHu has really helped us understand the importance of employee recognition and timely goals, and it has made a huge difference in our company culture. I highly recommend investing in CrewHu. Within the first week of deploying CrewHu, our staff had enthusiatically exchanged dozens of badges and created a slew of contests. Our customer feedback doubled. The level of engagement is palpable, and the best part is that the reporting is gold! Best incentive program we have invested in - in 15 years! Highly recommend! We have been very pleased since adding Crewhu to our business. It is an excellent way to give credit to peers and for our customers to give us ratings based on their experience. Since putting this in place I believe our overall moral has gone up and customer service has improved! Stephen has been great to work with and delivers excellent and prompt service every time. Great stuff! If you are looking for a tool to foster employee engagement then you have found it. Super product with awesome support. We've been using CrewHu now for three months and the Dolphins (our team) have taken to it like… fish to water? We love it! We've always valued giving recognition both from managers and peers, but struggled to make it an everyday part of work lives. CrewHu has the perfect tool for this and we can see it having a dramatic impact on our culture already. Of course a product is only as great as its support and Stephen and team have been amazing! Smart Dolphins IT Solutions Inc.
CrewHu is a awesome product. They have found a simple and fun way to bring gamification into our culture. Our employees love getting and giving the feedback. I would highly recommend this product to anyone wanting to build a great organization around a great culture. Awesome, easy to deploy, and phenomenal ROI. The best/easiest tool we've rolled out in years. We spent about two hours between planning the role out, setting up our CrewHu account/settings, and announcing it to the team. Within 24 hours our team of 23 people were using it enthusiastically. It immediately became part of our culture. The increase in recognition by both peers and clients has been awesome for morale. It's the biggest "No-Brainer" in the ConnectWise Marketplace. My team loves it! Our company has grown dramatically over the past few years. When we were smaller, it was easy to give and receive feedback. Now, however, we're approaching 30 employees and this has become challenging. CrewHu has been a huge morale booster – our employees now give each other tons of "kudos" and it fosters a really positive environment. We're also able to receive client feedback and, most importantly, take action in real-time when the feedback isn't where it needs to be. We implemented only a little over a week ago and the response has been tremendous. Lots of client feed back as well as internal badge giving. My employees are enjoying the competition as well as the feedback they are getting from our clients. Great product and installation support! Crewhu has been instrumental in providing us not only with instant feedback on client communication, but also in creating a rewards program and structure for our team internally. If you are looking for more than just a way to track surveys from clients, then Crewhu is the solution for you. The golden rule of customer service: Treat your employees how you want your customers to be treated.